Welcome to The Earth Faeries Hair accessory shop. I am a home based business and live and work in Wales. I make all of my products from my kitchen table and some times in the summer months from my garden. I have spent a long time sourcing out cruelty free materials in which to make my products from. And because I love all animals I have made sure that all of my items are suitable for vegetarians and vegans. They have also been made in a smoke free environment. Each of the finished products have been surrounded by quartz crystals and had a prosperity mantra recited over them before dispatch. This imbues my products with positive energy that will fill your venue, home and life. I only make my hair accessories made to order so they are created for you to make you uniquely you. These hand made rose ornaments have the texture of soft satin and are the perfect addition to your wedding tables. Weighing next to nothing and only 4 inches you’ll find it maximizes space and are easy to carry to your event. Each scroll is addressed to your guest and has a bespoke poem in it. They have multi uses making them very versatile and suitable for a wide variety of occasions. They are also a unique personalized gift for your guests to take away with them so double up as favors too! They also make great conversation starters as each guest can read out their bespoke poem to other guests. I use mine as ornaments and are a welcome touch to my decor. I want to give Melanie a great big shout out. I received my rose yesterday and I am so delighted with it! I’m sure the garden fairies gave A little magical touch to it as well.! It now has a very special home on my alter in my sacred space. Which is a sight to behold! Which they are glad to share! A charming delicate peach rose that is extra light weight and easy for your clients to pop in their pocket or bag to take home with them. The petals are soft and flexible and each petal has been individually crafted to form the rose. In addition the scroll will be personalized especially for you or your guests giving it that extra special touch! 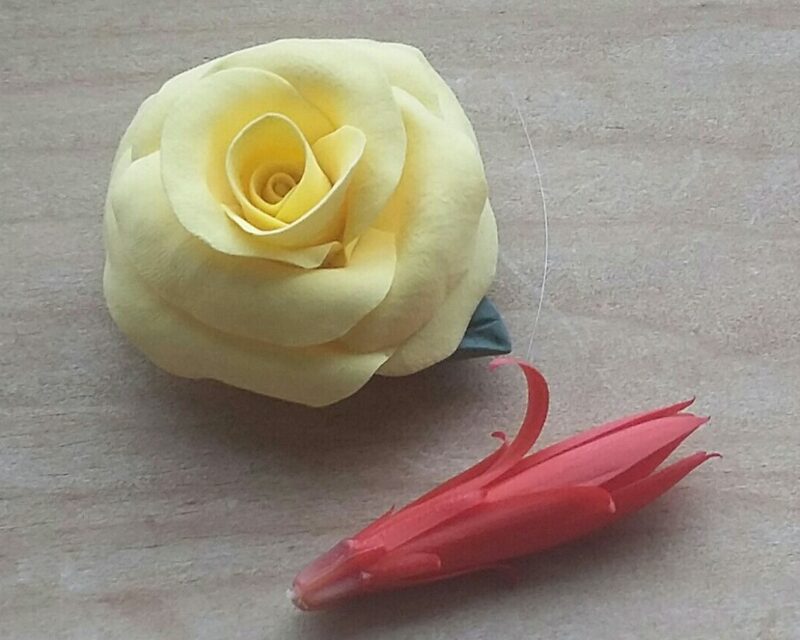 A buttermilk coloured hand made rose. A buttermilk coloured hand made rose with a hand made scroll with a personalized poem in for you or your loved ones. After you have ordered the ornament please contact me at theearthfaeries@gmail.com with your guests details. I will then be able to customize their unique poem for you or whoever the gift is for. Colours can be also customized for you for FREE so please email me for further details. Please join my face book group https://www.facebook.com/groups/TheEarthFaeries/ to see any new products, testimonials, plus ideas & inspiration for your wedding day.